Today we faced one of sailing's ultimate challenges- crossing the Singapore Straits, the world's busiest shipping lane. It was DEFINITELY one of our most memorable passages. We were in the first group of four boats to (reluctantly) leave Nongsa Point Marina, thanks to Dave and all the other captains who queued to complete checking out procedures very early in the morning. We quickly discovered that , since we have the older model of the Raymarine chart plotter (it is three years old), the system could not cope with the hundreds of AIS symbols and proceeded to freeze up completely. We didn't even know where we were exactly. Fortunately ASPEN has a more recent model and we were able to follow closely behind while Steve (our hero) called on the radio to warn everyone in the group about any vessels threatening us. In these shipping lanes small sailing vessels have NO right of way. It is simply a matter of constant vigilance and anticipating danger. Just to add a bit more excitement to the mix, the visibility continually worsened to just a few hundred metres. THEN a storm started to build up with massive amounts of lightning and boat-shaking thunder. Another waterspout sprang up about a quarter of a mile behind us. (No, we didn't stop to take photos!) This was the longest 20 mile passage ever! Our route followed the northern coast of the Indonesian Islands westward until we came to the narrowest part of the sea lanes, south of Singapore's Sisters Islands. At that point we said a prayer, held our breaths and started across the "highway". Fortunately we suffered no terrifying incidents, just a few close calls. It really was a relief to finally reach the "parked" freighters and to wend our way amongst them to the channel outside Marina Keppel Bay. We really WERE the most fortunate group as we did not get hit by the worst of the storms. Other boats experienced the AIS lockup and the visibility for them was nil. MOONSHINER's engine started to fail and then quit completely during all of this. FAI TIRA took up the tow with them for a short time and then LAROOBAA completed the crossing when FAI TIRA experienced difficulties. Finally the Marina Keppel Bay launch towed them safely to the Quarantine dock and into their slip. We had been trying for several weeks to contact Guan and Eunice (friends from our time in Singapore) to let them know of our arrival. Unfortunately, they had changed their email address and did not answer calls from us (their was no message machine and they didn't recognize the number from our sat phone). We gave it one last try the day before we arrived and managed to reach them! Unfortunately, the reception was so poor we just told them we were arriving at Marina Keppel Bay sometime the next day and would be contacting them at that time. Imagine our wonderful surprise to see them jumping up and down on the shore as we drove into the marina! They managed to find the name of the boat through googling Dave, Valerie, Allen, boat! Then the marina let them know when were coming in and there they were in bright yellow and orange rain gear welcoming us back "home"! Yes, we were back "home", but we would never have recognized Singapore if someone had dropped us here and asked us to guess where we were! We loved this city before, but it had a reputation of being sleepy (NOT our opinion!) No longer! The city is vibrant with new construction everywhere and with the most imaginative architecture! There are MANY more cars on the roads and some pollution haze is starting to develop over the city, but this is still minor. This city is about to leave Hong Kong in its wake! After the shambles and bureaucracy in Indonesia, Singaporean efficiency was a breath of air. 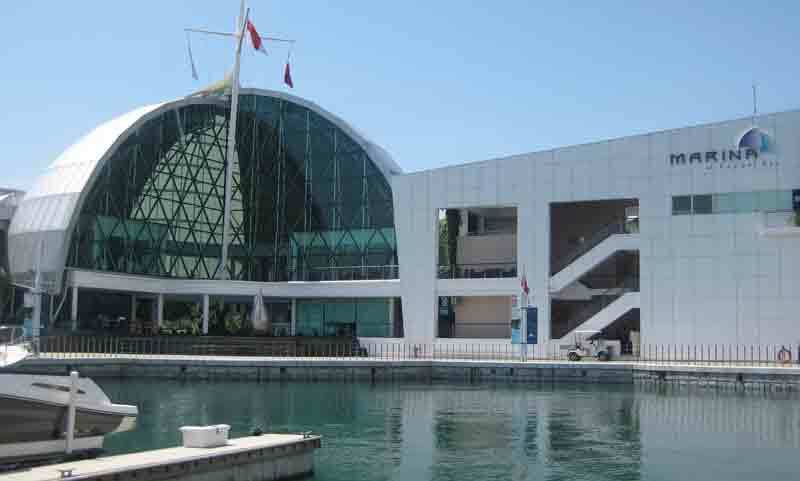 Normally there is a much more complicated system of checking in and out, but, since we were arriving en masse (in small groups so that the officials and marina staff could cope), arrangements had been made for officials to be at the marina. After tying off at the Quarantine dock, Dave completed the paperwork in ten minutes in an air-conditioned glass hut on the pontoon. Ten minutes later we were in our berth and being welcomed by the marina staff! What a marina this is! 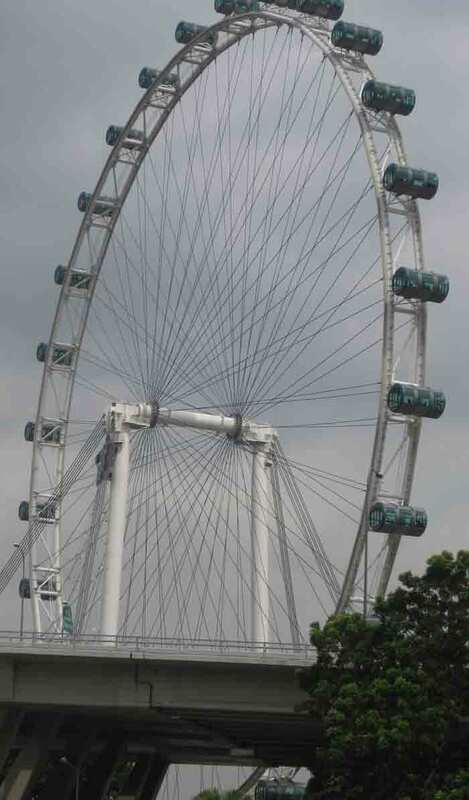 It is just being completed and is located under the cable cars going to Sentosa Island. The MRT (Mass Transit Rail), the fabulous subway system is accessible within a ten minute walking distance. The cruise ships dock just upriver from the marina and we could watch these behemoths arrive behind us. The marina is spotlessly clean, wifi is free, the showers are up to the minute and luxurious (but, curiously, lacking hooks inside the stalls on which to hang your clothes). The staff threw us a lovely welcome party in the Wine Glass cocktail lounge. Every morning a newspaper was hand-delivered to each boat and each evening there was a little gift- a plate of fruit, cakes, jellies. I almost wanted to stay and find out what else would appear! Here are a couple of pictures of the marina area. 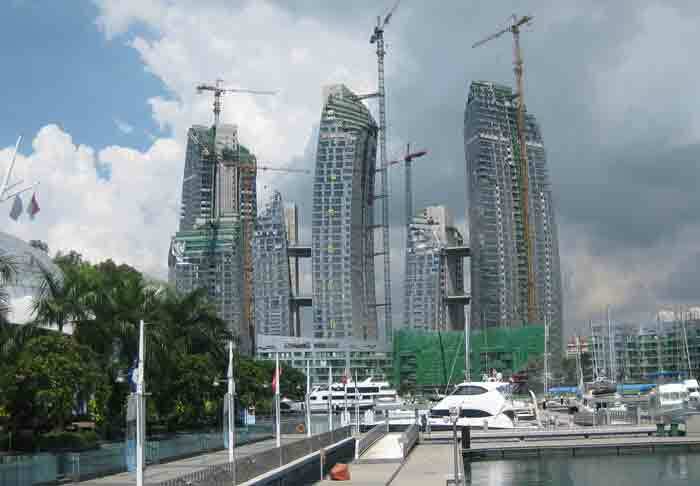 the neighbouring condominium towers under construction- they are part of the marina complex. I wish we could see them when they are finished! Eunice and Guan were the most amazing tour guides ever!!!! They took us under their wing and showed us the new Singapore (some of it THEY didn't recognize either!) and shared experiences with us we had not encountered in our three years there. Unfortunately, we kept forgetting the camera the first two days, so I will have to try and describe them for you. After a yummy lunch at the clubhouse, we were invited to take part at a Steamboat Dinner with Guan, Eunice, Angela (Eunice's sister) and two of their travelling friends. We were told it was casual, and remembering past casual dinners at housing blocks, I dressed very casually in capris. Well, THIS casual was in a lovely restaurant at a classy mall! (I just remembered, Dave never took me back to the sweet shops and bakeries! Probably all for the best). The steamboat dinner is like a very fancy fondue. There is a hot plate built into the tabletop and you order the food you are going to cook. The large flat pan is divided into two parts. We had seaweed broth in one side and chicken broth in the other. Then the feast began! We went through plates of prawns, thinly sliced beef, pork, fish, clams and vegetables. (I am sure I have not mentioned half of the dishes.) It is such a wonderfully sociable way to take dinner- with people helping prepare food for each other and everything absolutely delicious! It was a truly unforgettable evening. I had so much to eat I couldn't even THINK of dessert when the others stopped for coffee. On Sunday we certainly did not take a rest! I don't know how Eunice and Guan keep up this pace. They had just arrived back from an extensive tour in China and were expecting more friends to arrive at the end of this week! They may be retired, but they ARE younger- it makes a lot of difference! In the afternoon we were whisked away to the newest golf course in Singapore- the one belonging to the trades unions. It has a spectacular view over Marina Bay and all the development there. We sat on the terrace and enjoyed some fabulous gelatin-based desserts over shaved ice. (Sorry, Guan and Eunice, I have forgotten the names- and Dave is not much help in this either!) What a lovely refreshing break in the heat! Next we drove around some of our old haunts- and recognized basically nothing! Even Holland Village is now mostly indoors and has very limited parking. My old school is in another spot altogether! This is a photo taken from the ground during the day when Guan, Eunice and I walked around the Esplanade. Next stop was a visit to one of our favourite eating spots- The East Coast Parkway for chili crab and other seafood delights. We seem to be determined to eat our way through Singapore!!! !